Are you sick of lift lines on a pow day? Well with the Burton Family Tree Freebird Splitboard, you are set to explore endless pow lines without the crowd of the resort. With a tapered tail and rockered nose, the Burton Freebird Splitboard will float effortlessly through untracked backcountry pow. Time to get after it with the Freebird Splitboard. Skins and splitboard bindings sold separately. 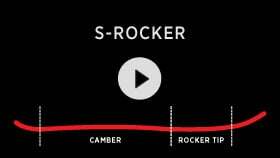 S-Rocker™  Burton's S-Rocker™ blend has more rocker towards the nose and subtly transitions into a cambered tail. By having more lift in the nose, you get improved flotation while maintaining speed through deep powder turns and ample stability in variable conditions. Infinite Ride™  This Burton-exclusive technology allows for maximized pop and strength by overbuilding the board, then putting it in a machine that breaks in the board for you. Whether you choose to ride Springloaded, Rocker, or Camber, rest assured that with Inﬁnite Ride™ your board will maintain its ﬂex, pop and feel from the ﬁrst day forward, season after season. Directional Flex  This versatile flex features increased pop in the tail and a more resilient nose that allows riders to easily maintain control and flow through all terrain and conditions. 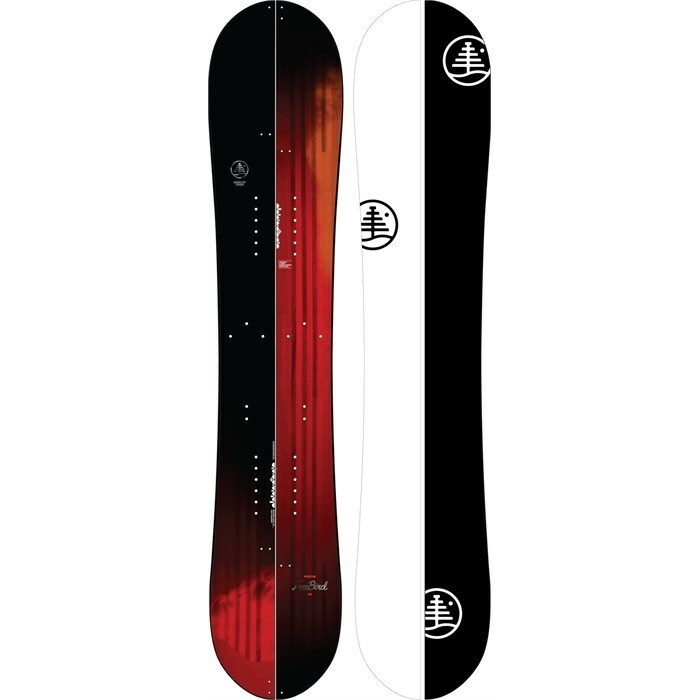 Directional Shape  The classic, most versatile snowboard shape, designed to be ridden with a slightly longer nose than tail to concentrate pop in the tail while still giving you plenty of float, flow, and control to rip any terrain or condition. Pro-Tip™  A tapered tip and tail thickness reduces swing weight for easier mobility. Side Effects  Lengthening the surface area at the tip and tail contact points improves edge-hold and allows the board to plane easier in powder. Enjoy a livelier feel and enhanced grip on groomers along with added float for overhead days. Super Fly II™ Core  Designed to target specific areas of the core to provide pop, strength, and reduced weight, this core is further optimized for float in Burton's freeride focused boards, and strength in park-focused boards. Dual Zone™ EGD™  Engineered Grain Direction manipulates the angles and direction of wood grains in the core for superior edge-hold, response, and durability. 10:45 Sidewalls  Aggressive rippers take note. 10:45’s extra-meaty, dual angle geometry results in bomber impact absorption. Sintered Base  Sintered bases are super-fast. Polyethylene pellets are forced together under extremely high pressure. The result is a singular piece of connected pellets with tiny pores across the entire base. Sintered bases absorb hot wax really well. Powder Powder snowboards love powder. Often associated with freeride snowboards, powder boards sometimes feature a wider nose and a tapered narrower tail. The binding inserts, which determine the rider's stance, are often set back on a powder snowboard to help the rider float the tip of the board through the deep stuff. Powder snowboards sometimes also feature rocker, a design element where the tip (and tail) rise starts farther back on the board, which also helps the rider maintain tip float through the pow. Splitboarding A splitboard snowboard is built specifically for the backcountry rider. Splitboards are designed to break down into two separate halves for touring and uphill travel (with climbing skins). Special bindings are required as well. Once you've reached the top of the terrain feature, you reconnect your splitboard for the ride back downhill. However, it's important to note that you will need appropriate backcountry tools, knowledge of the backcountry, weather and snow conditions and climbing skins to safely take advantage of the freedom of a splitboard. Rocker/Camber This features rocker in the nose and a camber extending under the feet through the tail. It is Built for riders that demand superior grip, stability, and responsive performance, but who still want to be able to float in powder.